Sale-a-bration gives reason for everyone to celebrate! Customers : Receive a free Sale-A-Bration product for every $60 purchase. Hostesses: Receive a free Sale-A-Bration product with a $350 or more workshop, in addition to the normal hostess benefits. Recruits: Choose any retail stamp set (a value up to $56.95) from the current catalogue when signing up during the promotion. There is no minimum order amount required, so anyone can take advantage of this offer. My version of the "UStamp Winter 09 SAB" project. I am so excited that "UStamp Winter 09 SAB" started on Saturday and the first project inspired me to make this. If you have not seen or heard of UStamp click on over to here. It is not too late to start becasue it is pdf and video style so you can work at your own pace. There are chats, prizes, international dream team demonstrators and the best project planners. What are you waiting for...click on over to check it out. So anyway, back to my project - It is a gift box with a necklace. I am giving it to my daughter wo also loves to read so I made her a matching bookmark. I wanted to use up some of my retired paper so I have used Berry Bliss Designer Paper and coordinating cardstock but you get the idea. Have a great day and thanks for checking in on me. I took the opportunity to use of retired stock for these cards as I figured if I use up the old DP I could justify ordering new stock...makes sense to me! It is a good thing I only made two of the cards on the left becasue he thought the sentiment was too personal and preferred the general "Thank You" for his cards. These little pillow boxes have been showing up on different blogs and it was not until my friend and fellow stamper Barb and I got together last Thursday evening and played with the new "Love You Much Bundle" and the Pillow Box Die. I really really like this die. These make fabuloue party favours. Change the designer paper from fun to formal and you have every occassion covered. Now, I learned something but it was not until I actually assembled the little pouch. I should have used the three heart punch on the section that has the concurve sides as opposed to the concave edges. The reason being that when it is assembled you would not see the ends sticking out. I suppose I could have added a piece of adhesive but I like the idea of easy access to the chocolate...you know in case of an emergency (hee hee). Anyway, I hope you like it, they are fun. What does Animal Crackers and Cole have in common? It is a lenghty story but well worth the read. I have the priviledge to participate in a fabulous cause - Cards For A Cure and YOU can too. The proceeds from this fundraising event will go to Pediatric Cancer Research. I am a member of the "Simply Stars" team head by our energetic, ambitious, extremely talented, and compassionate Heather Summers. I could not say this any better than Heather so I am lifting it completely from her blog. 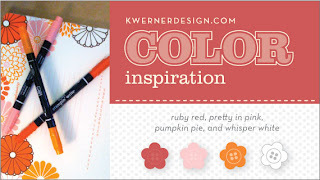 "(This is a bit of a mushy post) Stampin' Up! has done so many wonderful things for me and my family over the past five years. It is an absolutely amazing company to work with, that carries beautiful product but more importantly has such caring people associated with it. I wrote to Stampin' Up! explaining that I am going to be hosting a fundrasier for Pediatric Cancer and would they be willing to support my venture with a small donation. Well, to my surpise I received a box today with hundreds of dollars of product to raffle off at our next event! How amazing is that??? 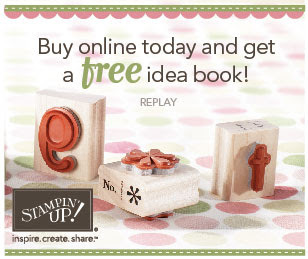 Part of why I love Stampin' Up! is because it enables me to work with a group of friends in my team to raise money for so many wonderful causes. This one is particularly close to my heart. About three years ago, I heard about an amazing little boy named Cole Petrie. 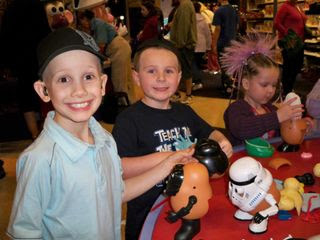 He was a JK student at a local school and had been diagnosed with Stage IV Neuroblastoma in September of 2005 (4 days before he was to start school!) He was presented with a nerf football sized tumour near his right adrenal gland that had metastasized to his bone marrow being 98% packed with cancer. Cole has endured many tests, procedures and treatments in the over two years since as well as being hospitalized 170 nights in the first 1-½ years due to treatments, complications and infections. He has also been in the outpatient clinic for appointments, bloodwork, tests and transfusions about 120 times so far. Currently, Cole is at home and they are blessed with Cole’s good health while cautiously optimistic about his future. Unfortunately, a very high number of Stage IV Neuroblastoma patients relapse within 1-2 years and at this point in time that is considered having virtually no cure. Cole continues to be the sweetest, most loving boy yet with a spunky determined nature and a beautiful smile that can light up a room." With the help of my downline (Simply Stars), friends and family my next fundraiser event will be for Pediatric Cancer. I would like to make a difference not only for Cole, but also all the boys and girls that teach us about strength, reality and perspective. If you would like to learn more about Cole, please visit his site HERE. We hope you can join us for an evening of fun and stamping! All proceeds will be donated to Pediatric Cancer. Cole and his family will help with dispersing the funds to areas of need. Included in the cost are 7 Projects AND a stamp set!!! PLUS cookies and coffee and LOTS of door prizes! Format – come when it’s convenient for you! Find your seat and stay there to make 7 projects using the brand new stamp set Animal Crackers! Enjoy beverages and snacks at your leisure. If you can’t join us on February 27th, you are welcome to purchase a kit for $40 which will include all the instructions to make the projects, the necessary supplies and the stamp set! There will be LOTS of door prizes!!!! We will be raffling off some great stamping prizes as well. Tickets are 1 ticket/$1 OR 7 tickets/$5 OR 15 tickets/$10 dollars. There will also be a 50/50 draw…..50% to donation and 50% to the lucky winner in their choice of Stampin’ Up! product! Please bring with you your own scissors and adhesive, if possible. This is a great event to learn how to stamp, so if this is your first time, come on out, have some fun and learn something new! 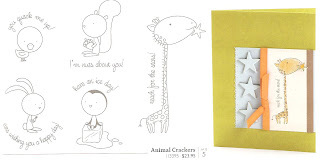 The stamp set we will be using is "Aniaml Crackers" and you will get to take home...SO CUTE! 1) plan on joining me along with Simply Stars to attend the Cards for a Cure Fundraiser and if you cannot attend, kits are available to purchase (Canadians Only). 3) I am on the Bone Marrow Registery and I challenge you to do the same. To learn more about becoming a bone marrow donor click here. I have to say I was flattered when a friend of mine asked me to design an invitation for a special group of young ladies who attend the Upper Deck here in Tillsonburg. The Upper Deck/YFC (Youth For Christ) is a drop in centre for youth where they can feel safe, accepted, and most of know the love of Jesus Christ. The invitation had to be soft, feminine and special. I say "special" becasue the girls receiving these invitaitons are special although they did not think so in the beginning. The girls complete a 10-12 week coarse where they learn to love and respect themselves. They build self confidence, self esteem and values. Upon completion of this program each young lady will be invited to a special celebration and it is a big deal. I am not sure of the all the details but I was excited about this challenge and could not wait to get to work on it. The top card was my first sample but wished I had used ribbon to soften the look so that is how I came about the bottom sample. Have a great day and remember to make someone feel special today. I thought I would take a try at Kristina Werners' colour challenge #38. I have never tried a sketch/colour challenge before but when I saw the colours I thought why not. The colours spoke "happy" and "little girls" so I chose the Crazy for Cupcakes stamp set from Stampin' Up! As I mentioned earlier in the New Year I was going to pull the theme through to the inside of the card so here it is. The first time I saw this on Heather's blog I had to CASE (copy and share everything) it to coordinate with my daughter's bedroom. This is so cute and just what every girl wants for her room. It has a mini cork board with little flowers push pins and a secret note compartment. Cost: $20.00 incluedes the Little Flowers Stamp set. I was thinking about Youth group this coming Friday and what we would stamp. Since Valentine's Day is not far off we will be making a Valentine's card for them to give to their parents along with birthday cards. These girls are a great group of enthusiasm and willingness and love to stamp. Since I donate my time and resources to the Youth at our church I thought I would use the Berry Bliss DP from the previous catalogue. I love it and can't believe I didn't use it all yet. The cards stock, designer paper and ink are all from Stampin' Up! however the stamp is from Michael's $1.50 bin. I thought this card was pretty and I am sure the youth will be happy with it as well. Stampin' Up! has just released the retirement list of accessories which you can see below. This list will be updated on my blog as items are sold out . Act quickly since the Retired accessories are very limited. These items are available while supplies last or until January 18, 2009 which ever comes first. The Inventory Blowout (up to 50% savings) starts Today - January 18, 2009 click here.